Team BackMotor wishes to thank our sponsors: Kathleen Tax / Arias Pistons / R & R Connecting Rods !! That is a pretty cool vid! 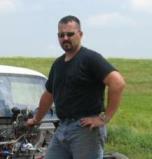 Hi Mike,..Welcome to the Super Crew section,...Hows the A/fuel motor coming along ???? We want to hear about the specs and pictures,...we dont hold nothing back over here with are combos,..
unless it has to do with cake,..because we all know nobody knows what the filling is untill we bite into it. Thanks for the warm welcome gang !! The A/Fuel engine is coming along nicely !! 496" BBC, aluminum heads "solids" w/ CNC porting, CFE sheetmetal intake, Enderle birdcatcher/pump/nozzles, Arias custom pistons, R & R alum connecting rods, custom designed camshaft by Chase Knight of Crane Cams fame (Thanks dude !!) 25% Nitro in the tank, fuel system tuning by Ron Evans (he is the man !!) MSD ignition.